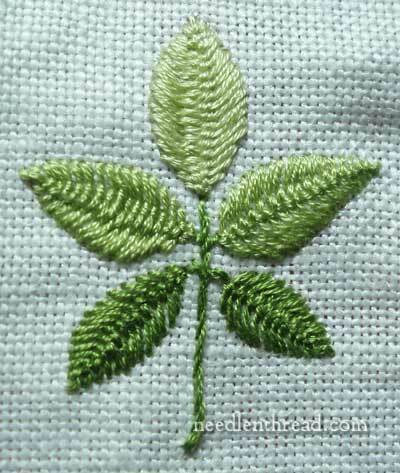 Cretan Stitch – Close it Up! Cretan stitch gets a bad rap, in my opinion. It’s normally demonstrated open, with the stitches spread out so that they look kind of like a pointed and twisted herringbone stitch. And that’s all well and fine – but cretan stitch can do more than form decorative lines. When worked closed, it can fill up a space pretty effectively. 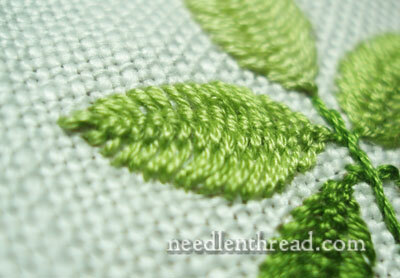 It’s a perfect stitch for leaf shapes, for filled bars, petals, and so forth. Don’t underestimate the cretan stitch in its versatility! Closed cretan stitch doesn’t form a solid line down the middle of the filled area (like Vandyke stitch, for example). 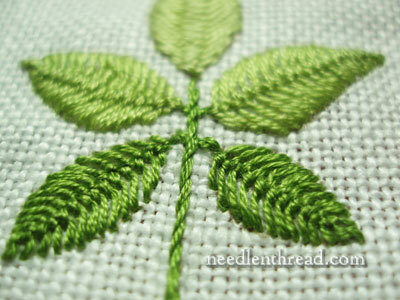 Instead, it forms a kind of wide plaited area in the middle of the stitch – just enough to give a little texture. Because of that twisted area in the middle – where the threads are held together – it can cover a wider space than satin stitch usually can. And best yet, it works up quickly! So next time you’re looking for something to fill up a shape, why not try closed cretan stitch? I bet you’ll like it! of stitches&beautiful graphics in your site. I like those interested @ hand embroidery. Hi, All! Thanks for your comments! Saranya – the fabric is linen, and it is an even-weave, so it can be used for counted stitches as well. The thread isn’t floche – it’s stranded cotton. I think I used three strands on that motif. I’m in the process of re-filming the video on cretan stitch, so I hope to replace the old one with a new one sometime in the next week! The leaves look really lovely! One question: what cloth is it worked on? Is this floche on some kind of aida cloth or is it just zoomed in so much that the evenweave looks like it could be used for counted thread techniques? I absolutely LOVE the cretan stitch. I agree, you can vary it so many ways — shaping both the leaf and the center strip independently as you move down. Very interesting and great texture! Mary , thank you for clarifying this stitch! Even I like to use different stitches in my works. I tried the cretan stitch recently, with not very favourable result(it is probably me who is so critical, cos others liked this stitch). I want to know what kind of thread you have used and fabric. I used 3 strands of anchor threads(only ones available for embroidery) and a cottton cloth. Hi, Neha – I used stranded cotton (DMC, but exactly like Anchor) and I’m working on linen. It’s helpful to strip your strands of floss apart and put them back together before you stitch, to get a nice “full” stitch out of them. Other than that, it’s just a matter of practice. The stitch works well on any cloth – cotton, linen, etc., – so I’m sure you’ll get it!! Do you think it would be easy to make the textured area curve? It’s such a lovely stitch. Thanks Mary. Your blog is a treasure. I’ve been considering various ways to make a wrinkle in a hickory nut (the husk is kind of wrinkled). Or I could make it a walnut and forget the wrinkles! Pls let me know the construction details for the Stitch “Round Cretan”. Previous Previous post: Next Embroidery Projects Lining Up!